Manages all your email templates. Click 'eMails -> eMail templates manager' module link on the main interface to enter the management mode. Click the corresponding button on Search employees, Employee editor, Search contacts, Contact editor, Festivals manager or Queue and log manager interface to enter view mode. Important: to send e cards in AMSBE, please read this article first: How to send an eCard (built-in, local and online) in AMS Birthday Edition? [Template name] - uniquely identifies the email template, must be filled. [Subject] - the subject of current eMail template. Tips: AMSBE prevents sending the no-subject eMail for anti-spam reason. [Attachments] - the attachments which will be sent with the message, you can add/open/run/delete/clear it/them via clicking the picture buttons. [eMail type] - the default type can be set in the 'Preferences' tab page on the Options interface. To maximize/restore the content area, please click <Expand>/<Restore> buttons on the toolbar. To maximize/restore the [Attachments] list, please double-click its blank area. <New> - creates a new email message <Ctrl+N>. <Edit> - edits the selected template <Ctrl+E>. <Copy> - duplicates the selected template <Ctrl+R>. <Delete> - deletes the selected template <Del>. Tips: if you deleted the template that is used by some contacts/employees/festivals, the reference will be the corresponding default template. <Save> - saves current template <Ctrl+S>. <Cancel> - cancels your changes in current template <Ctrl+D>. 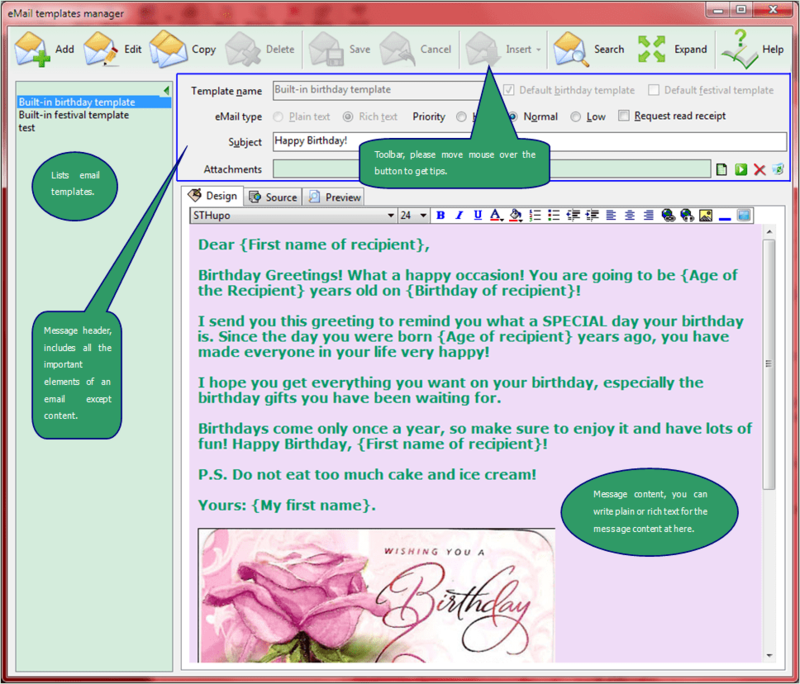 <Insert> - inserts something into content/subject, such as signatures, macros, text in files, built-in greeting cards. <Search> - finds text in content <F3>. <Expand> - expands the content area <F4>, after clicked, it will display as 'Restore'. <Restore> - Restores the content area <F4>, after clicked, it will display as 'Expand'. - runs/opens the selected attachment <Enter/double-click>. - removes the selected attachment<Del>. - clears the attachments list. Rich text email toolbar buttons - please see their tooltips to know about the functions.